The field of family, child, and couple assessment continues to evolve and change since the first edition of this book appeared in 2004. Couple and Family Assessment, Third Edition, is a thoroughly revised and updated resource for anyone working with children, adolescents, couples, and families. It provides an in-depth description of an even larger number of clinically useful assessment tools and methods, including issue-specific tools, self-report inventories, standardized inventories, qualitative measures, and observational methods. Each chapter provides strategies for systematically utilizing these various assessment methods and measures with a wide range of family dynamics that influence couples and families. These include couples conflict, divorce, separation, mediation, premarital decisions, parenting conflicts, child abuse, family violence, custody evaluation, and child and adolescent conditions, i.e., depression, anxiety, conduct disorder, bipolar disorder, obsessive compulsive disorder, autism, Asperger’s syndrome, and learning disorders that can significantly influence family dynamics. This third edition features the latest, most common and important assessment tools and strategies for addressing problematic clinical issues related to working with families, couples, and children. Chapters 3 through 11 include matrices that summarize pertinent information on all instruments reviewed, allowing readers to instantly compare more than 130 assessment devices. Finally, the book provides extensive clinical case material that illustrates the use of these various assessment tools and strategies in a wide array of clinical situations. 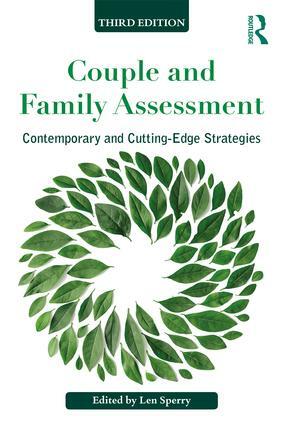 Couple and Family Assessment, Third Edition, will be useful to both trainees and practitioners as a ready reference on assessment measures and strategies for working with families, couples, and children. Len Sperry, M.D. Ph.D., is Professor of Mental Health Counseling and Director of Clinical Training at Florida Atlantic University, Boca Raton, Florida, and Clinical Professor of Psychiatry and Behavioral Medicine at the Medical College of Wisconsin, Milwaukee, Wisconsin. He is a clinical fellow of the American Association of Marriage and Family Therapy, editor-in-chief of the American Journal of Family Therapy, founding associate editor of The Family Journal, and editorial board member of the Journal of Marital and Family Therapy. Among his 1000+ publications are eight books on families and couples.